This White Barbecue Chicken is sure to become a new crowd favorite at all of your cookouts this summer! 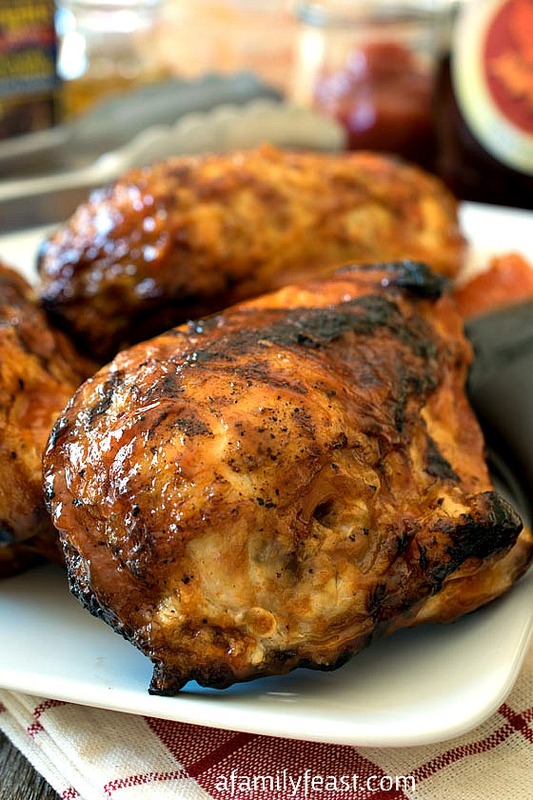 As promised, today we’re sharing our recipe for White Barbecue Chicken. It uses that deliciously zesty White Barbecue Sauce recipe that we shared yesterday, and the chicken comes out super juicy and so flavorful! I’m even going to go as far as saying, I may never cook with red barbecue sauce ever again! We started by mixing up a double batch of the White Barbecue Sauce – and then used some of the sauce as a marinade for the chicken. Once the chicken marinated for about four hours, we were ready to grill. I should note here that you do want to brush off any excess marinade before grilling because the sauce will burn before the chicken fully cooks through. But don’t worry – once the chicken is tender and juicy, you’ll brush on more of that white barbecue sauce toward the end of the cooking time, giving this White Barbecue Chicken more of that fantastic zesty flavor! We also served our White Barbecue Chicken with more sauce on the side – dabbing a little bit on the grilled, caramelized skin. 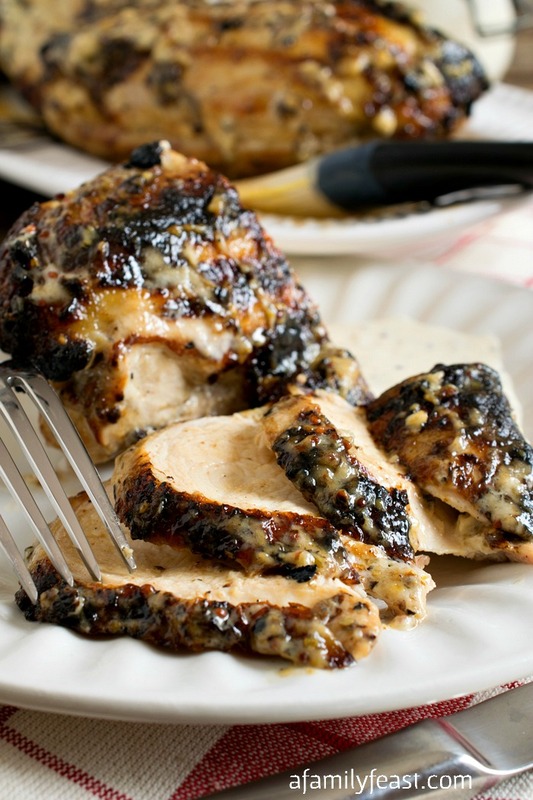 The zesty flavors in the creamy sauce together with the grilled chicken are absolutely fantastic! P.S. 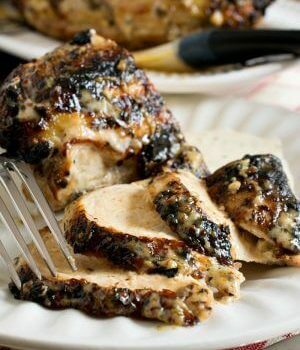 This recipe works equally as well with chicken wings or other chicken pieces as it does with bone-in chicken breasts. Enjoy! 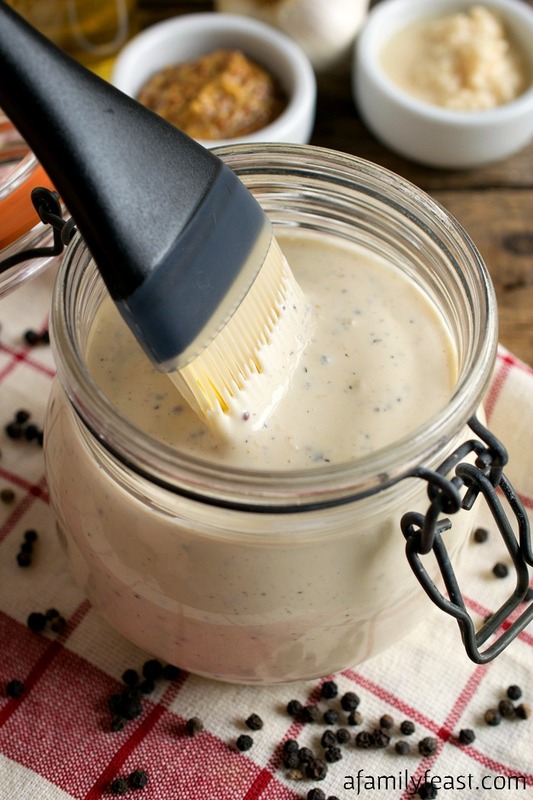 Prepare a double batch of the White Barbecue Sauce, recipe here. 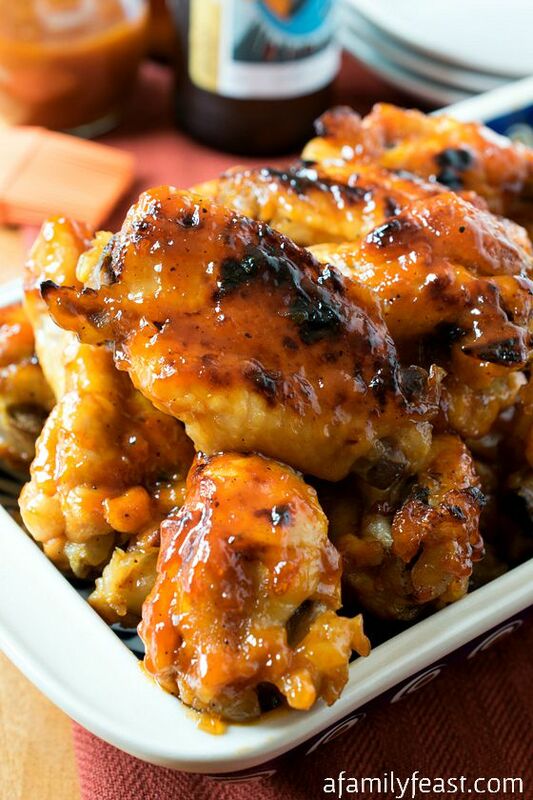 Use two cups as the marinade and reserve one cup to cook the chicken and one cup to serve on the side. Place the four breasts in a gallon zip lock bag with two cups of the White Barbecue Sauce and marinate four hours or overnight. Remove chicken from bag and discard marinade. Rinse the chicken and pat dry with paper towels. Brush three tablespoons of olive oil over the skin and sprinkle with the salt and pepper. Place skin down on the hot grill and cook two to three minutes just to give grill marks. Brush the back side with the remaining oil and flip. Cook two minutes. Move the chicken to an upper rack or a cooler side of the grill, skin up and lower the temperature to medium. The internal grill heat with cover closed should hover around 425 degrees F.
Take the one cup of White Barbecue Sauce and brush a small amount onto the tops of the breasts. Cover grill and wait five minutes. Brush again and again close the lid and time five minutes. After the final sauce goes on, cover the grill and cook another 10-20 minutes or until the internal temperature reaches 155 degrees F, using a probe thermometer. Total cooking time should be about 30 minutes but your time may vary based on the size of the breast. Remove to a platter, brush a little of the remaining sauce on top and let rest five minutes. Serve with the reserved cup of White Barbecue Sauce. Sure Janet – after it’s baked through, if you still want it crispier, just put your chicken under the broiler for a minute or two. Can’t wait to taste it!!!! Hope you both enjoy the sauce Tammy! Thanks for your feedback Susan! 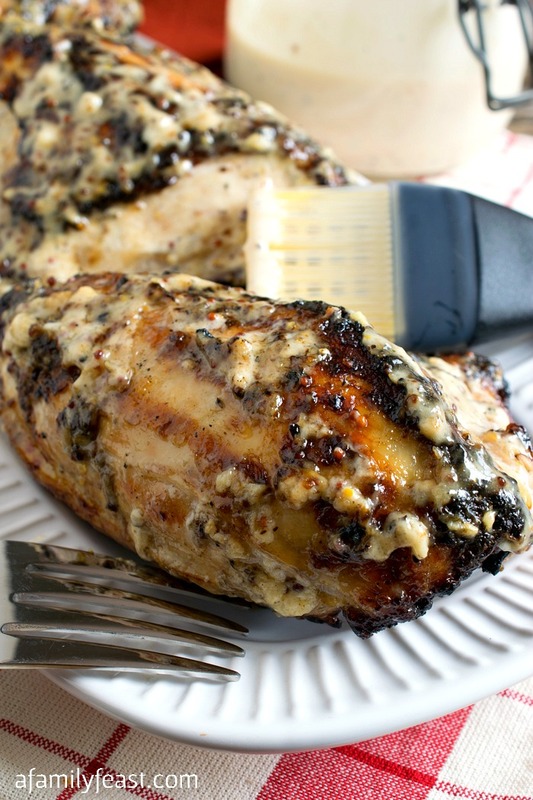 Can you bake this chicken instead of grilling and if so how long? Looks yummy!!!!! wow what an amazing tasting bbq sauce. 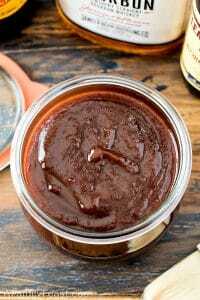 I have to start by saying that I truly do not like premade BBQ sauces but when I came across this one I thought well I shall make this for my friend. Also I really usually hate anything with vinegar. OMG OMG OMG this was fabulous. I could not find horseradish sauce but I did find a mustard with it in it. So I made with drumsticks and instead of a grill I used my oven at 425 and 20 min times three basting every 10 minutes. I ate three. 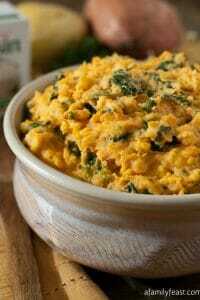 Thank you – .So glad you enjoyed the recipe Angela! 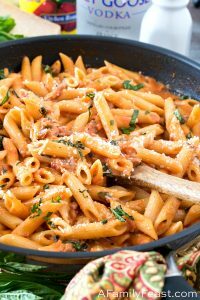 Recipe looks amazing! How would this work if i decided to put the chicken in the oven? At what temperature and how long would you recommend? Thanks! Hi Dan – Sure – you can roast the chicken breasts in the oven – I’d suggest a slightly higher temp such as 375 degrees F, and since the size of chicken breasts at the store can vary so much – the cook time will vary. We’d still recommend using a probe thermometer to judge the timing but I’m guessing it will take at least 20 minutes to cook through (or longer). Since you do want some caramelization, you can also put the chicken under the broiler for a couple of minutes toward the end of the cook time. Hope that helps! When you say rinse the chicken after soaking in marinade, that means under water and completely removing the sauce on it? 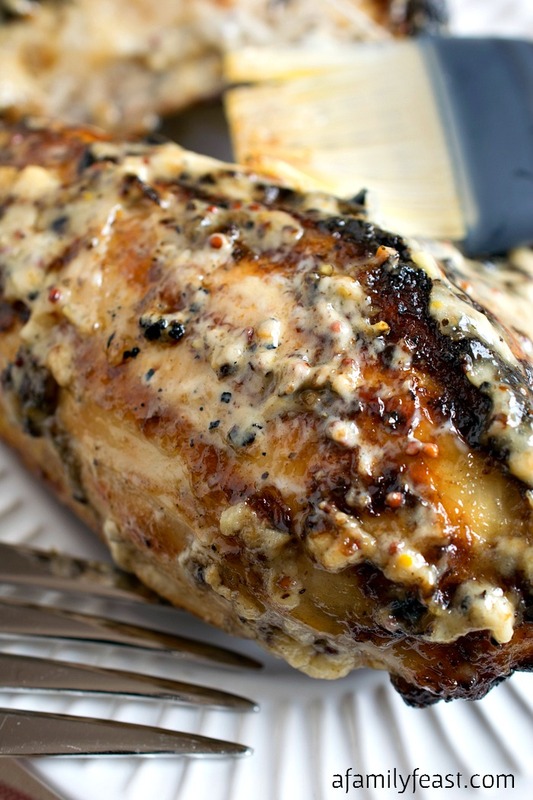 Hi Shrese – Yes – much of the flavor gets into the chicken during the marinating process. And you’ll also add more sauce once the chicken is cooked (this white sauce would burn while grilling if you left it on the chicken the entire time it cooked on your grill). Hope that helps clarify! Enjoy! I have never rinsed marinade off any an type of meat before grilling. It doesn’t make sense. Hi Nancy – Thanks for your comment. In this case, we did that to ensure that any remnants of the marinade didn’t burn as the chicken was grilled. Hey there! 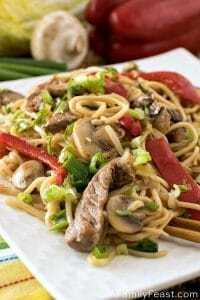 Could you try this on a combo of cast iron skillet and oven, do you think? Hi Caitlin – Yes – that should work! Enjoy! Thank you so much for writing to us Stephanie! Please let us know what you think of this version! We’re more than a little addicted to this sauce – can’t wait to try it on pulled pork!